The desert willow is a deciduous, hardwood tree found in warm areas of the United States. The tree can grow between 15 and 30 feet in height with the same width. The desert willow branches do not hang like the weeping willow, instead pointing straight into the air. 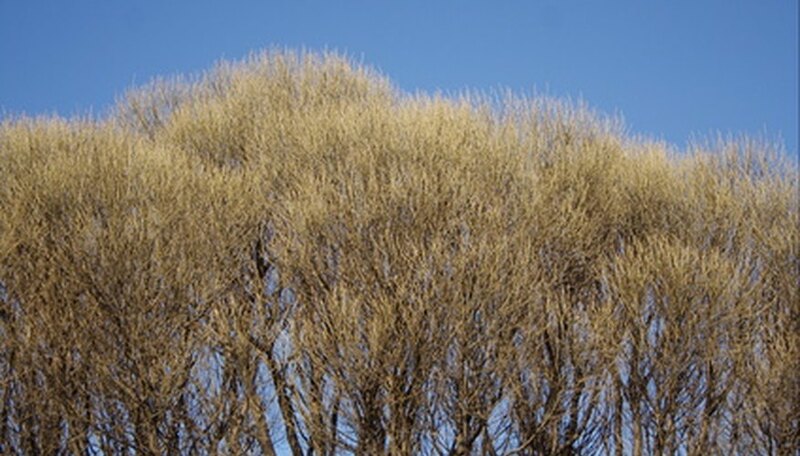 Desert willows produce a trumpet-shaped flower that is usually pink or dark burgundy in color. To prevent disease and aid in flower production, the desert willow requires pruning after the flowers have passed around Christmas time. Remove dead or broken branches and limbs from the desert willow to improve appearance. Cut away shooting branches that grow vertically from the main branch to encourage horizontal growth in the tree. Prune small branches that are strong 1/4 inch above buds to encourage new bud growth. Remove crossing branches, and prune excessive foliage from the canopy of the tree to allow sunlight into the trunk. Do not remove more than 30 percent of the canopy during the summer months if pruning is necessary, as this will burn the tree. Graythorn is a perennial shrub that's native to Arizona. It is large and wide, growing up to 10 feet tall with small white flowers that bloom in the summer. Tiny, sharp thorns cover the branches of the graythorn, where it protects fruit that birds such as quail and doves relish. This plant has medicinal value as well, as the roots can be boiled and used as soap. 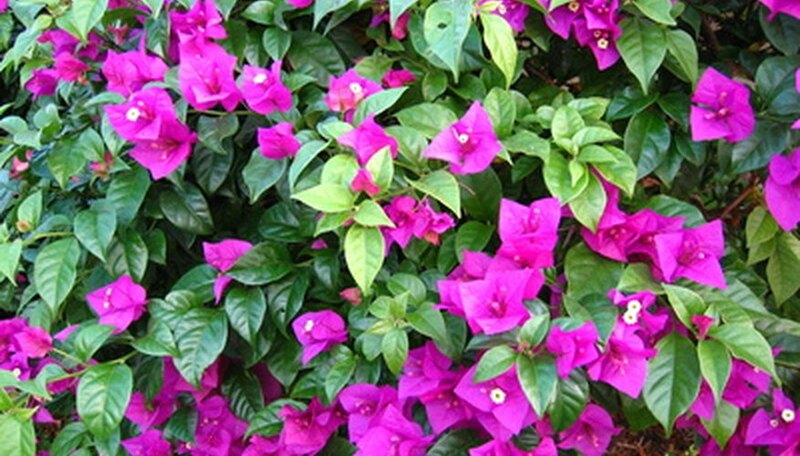 The subtropical shrub/vines bougainvillea is possibly one of the most well-known desert plants with thorns, mainly for its bright foliage that blooms year-round. It thrives in desert environments, but can grow in other climates as well. These thick wood stems have large thorns, sometimes reaching beyond 2 inches in length. This shrub grows quickly and produces purple and pink flowers. This vicious perennial with an ironic name is ubiquitous to Verde Valley. The curved thorns resemble cat claws, and hook into anything that bumps into them. During spring, yellow flowers cover the shrub, making the thorns even more difficult to identify. Cat claw acacia can grow up to 10 feet tall and skinny. This perennial shrub, also known as a coach whip, can grow up to 20 feet tall with flexible, wobbly, thorny arms that shoot up from the ground roots. When water is plentiful, the stems are covered in lush green leaves; during dry times, they are bare. 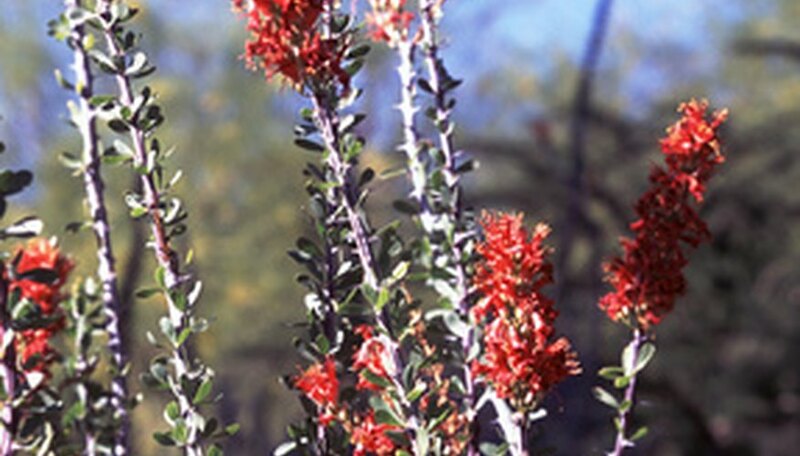 Each spring and summer season, the ocotillo blooms with red and orange flowers that add splashes of color to the desert landscape. It thrives on mountainsides and rocky slopes. This plant resembles a cacti, but it is not classified as one. Even with the most careful high desert landscaping, a desert garden can look barren without the bright blooms of more temperate climes. Decorate and enhance your garden with birds and butterflies. There are many native plants that attract flying friends, including the hummingbird bush. Milkweed draws butterflies and the hedgehog cactus attracts songbirds, butterflies and hummingbirds. Living in the high desert, fire can be a fierce and even deadly enemy. If your home is in an area vulnerable to seasonal flare-ups, consider surrounding your house with fire-retardant plants as part of your desert landscaping. Many traditional high desert garden mainstays such as black sage, desert agave and purple nightshade will not significantly contribute to a fire, allowing blazes to burn out before they reach your home. The dry hot days of the desert can be quite pleasant, provided you have some shade. Blur the line between indoor and outdoor high desert landscaping with covered pavilions and galleries. Create outdoor rooms and walkways out of adobe tiles or cast earth for a natural, high desert look. Add furniture, shade-loving plants, statues and even paintings to create the perfect desert day room. The desert willow (Chilopsis linearis) is a rapid-growing, deciduous tree that has a non-invasive root system. Desert willow trees reach heights ranging from six to 30 feet and produce an attractive pink, white and lavender bell-shaped flower. Bougainvillea is a well-known flowering plant throughout the United States, and it flourishes in Arizona. This subtropical plant can either grow as vines or as a shrub with nearly year-round blooming season. 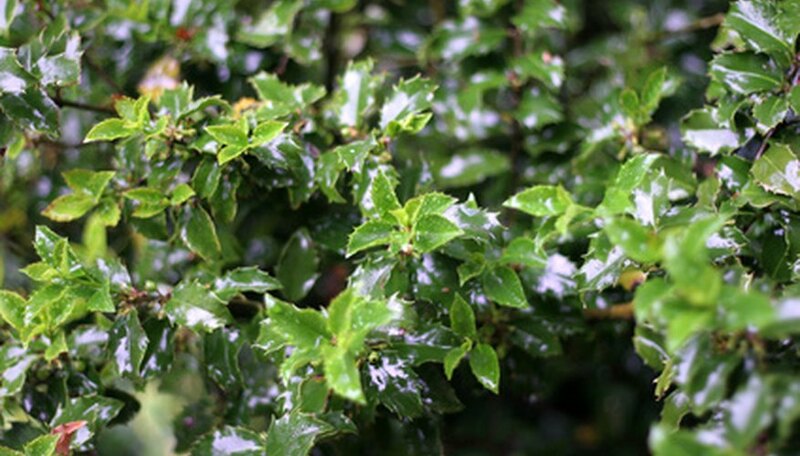 This shrubs have thick woody stems with long thorns that range from a half to 1 1/2 inches in length. The bright blooms are usually purple or pink, and once established grow rapidly. Bougainvilleas are regularly used as landscaping for households, businesses, parks, and gardens. This uniquely named perennial grows all over Arizona but is ubiquitous to Verde Valley. The yellow blossoms pop up in spring season. This shrub can grow up to 10 feet tall and is narrow, and got its name from the sharp curved thorns or "claws" that line the stems and branches. They dig into anything that brushes against it. Catclaw patches are important bird and wildlife habitat. Graythorn is a perennial shrub native to Arizona that blooms tiny white-green flowers in summer. This shrub can grow up to 9 feet tall and very wide. The small thorns cover all the branches of the graythorn and house many wild bird nests. It produces a fruit that quails and doves love to eat. The roots of this shrub can be boiled, ground up and used for soap. Pinch your seedling adenium during periods of vigorous growth to get a well-branched plant, Tropical Nursery recommends. Trim back the seedling's branches to 1-inch stubs, just where the green starts above the base. Always wear gloves when pruning adenium. Use garden snips to prune long, leafless stems in the spring. This will promote new growth and boost flower production, Tropica Nursery says. It's also a good time to repot the plant with fresh soil. Cut off roots from overly large root systems at the junction with the adenium's trunk. If you're transplanting your adenium, this will help you ease the plant into its new pot, give you more room for fresh soil and also spur new growth. Purchase healthy starter tomato plants from a nursery. Choose a tomato variety that will grow well in the desert climate. Ideal varieties include Early Wonders or Early Girl. This is because they have shorter gestational times than other varieties. This means they will fruit more quickly. Plant your tomatoes from February to the end of March. Plant again in August for a fall crop. Choose a planting spot for your tomato in a pot or in the ground where there is partial shade. Dig a hole with the shovel just larger than the root ball of the tomato plant. Put the plant in the hole. Combine good quality potting soil and humus into the pot or hole before planting. Cover the root ball up to the first set of branches. Water the tomato plant generously after planting with a phosphorus-rich starting formula. From this day on, water the tomato plant every other day, making sure to soak all the way down to the root ball. Once the plant has matured, water every couple of days, less during monsoon season if there are heavy rains. In the summer, fertilize every week. Cut away any dead or diseased branches from the plant to tidy up appearance. Cut away any stumps on the plant to prevent rotting or disease in the future. Remove any root suckers (newly developing limbs) from the bottom of the tree. This will prevent new sucklings from competing with the plant for nutritional resources. Thin branches that are crossing each other or touching by removing older plant growth to encourage the newer branches. Create heading cuts by trimming away the tips of branches. This creates bushiness in the plant by promoting new growth. New offshoots will begin in the spring. Bare root trees are sold dormant, and should be planted before buds break and new growth begins. Planting bare root peach trees when dormant will limit the amount of stress the plant receives, and allows the tree to grow strong anchoring roots once growth resumes. Bare-root peach trees should be planted in January/February. Potted peach trees purchased from nurseries should be planted while the tree is still in active growth. The tree should be allowed to grow for a few months before it goes into winter dormancy. This will allow the tree to grown new permanent roots and become established before winter. Plant potted peach trees after the summer heat has passed, ideally September/October. Do not plant peach trees during the summer or when hot, drying winds are expected. Newly planted trees lose too much water in these conditions, stunting or killing the tree. If drying winds are inevitable, plant the tree in a sheltered spot to protect the transplant. Some high desert regions get an occasion frost or freeze during certain times of year. An occasional freeze is also common in desert regions surrounded by mountains where cold continental air settles in desert valleys. While established peach trees can withstand and actually thrive in cold temperatures, newly transplanted trees are vulnerable and should not be planted if a cold spell is in the forecast. Protect new transplants with an old sheet if a frost is expected. The most important variable in successfully growing peaches in the desert is choosing the right variety. Some full size varieties that do well in the desert are: "Phoenix," "Early Grande," "Florida Prince," 'Desert Gold," "Early Elberta," "Bonita," and "Rio Grande." Smaller desert adapted dwarf trees are "Bonanza II," "Southern Sweet," and "Southern Flame."